By their own admission, the Arizona Coyotes said they did a number of things well Wednesday night. Despite progress, there was nothing to show for an improved performance except another bout with frustration. After a 2-1 loss to Vancouver before 12,255 in Gila River Arena, the image of frustration swept through the Coyotes dressing room like an unwelcomed tornado. There was captain Shane Doan, sitting in front of his locker stall, skates still affixed to his feet, and the sense of helplessness enveloping his frame. Losing a hockey game may be one thing, but Doan’s sense of despair looked like the Coyotes dropped into an abyss. 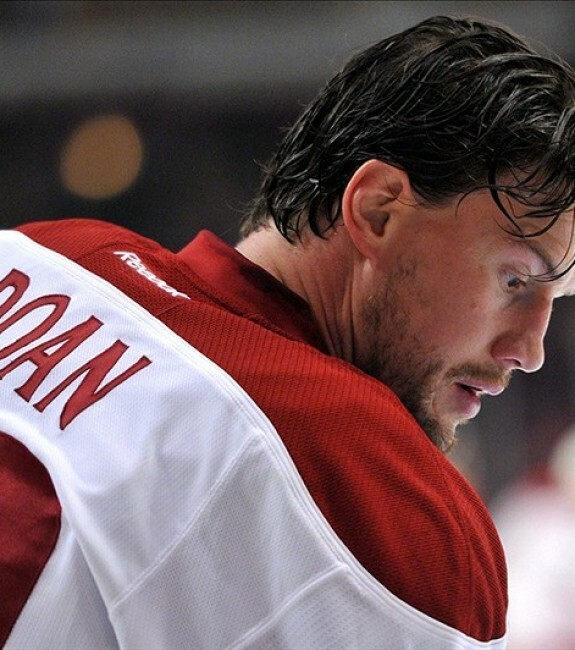 Doan’s persona represented another telling image of a season which could be swirling out of control. The loss was the fifth in a row for Arizona, and now makes the climb through the Pacific Division and qualification for a spot in the Stanley Cup playoffs more arduous. While the efforts to fore-check and kill penalties were positive, the bottom line is to gain on teams directly ahead. With Vancouver and now Calgary this Friday night and at San Jose on Saturday, the opportunity to pick up important standings points against Pacific Division opponents is clearly at hand. That reality characterized post-game remarks, and put recent event in a dire perspective. If the Coyotes had issues with their recent penalty kill, that segment of their game showed improvement. Coming into the game, Arizona was 28th in the NHL in killing penalties and last in the league in that category. For the game, the Canucks went 0-4 with the man advantage, and Tippett used three successful pairs of penalty killers, Tobias Rieder-Hanzel, Jordan Martinook–Tyler Gaudet, and Doan with Brad Richardson. The result in this segment of their overall game was encouraging. What continues to plague this team is elusive standing points. For the Coyotes, victories within the regulation 60-minutes have been difficult. Since Jan. 9, they have only two regulation victories in 12 games. Now with the Flames and Sharks directly ahead, the vise seems to tighten. “That mistake” was reference to an off-side by Hanzal which took a goal away from Kevin Connaution mid-way through the opening period. If that was not enough, the winning goal from Vancouver’s Jannik Hansen deflected off the left thigh of Oliver Ekman-Larsson in front of his own net and flipped in behind net minder Louis Domingue late in the second period. At this point, the Coyotes need a full, 60-minutes of mistake-free and mentally sharp hockey. Here at the top of the stretch run, they seem to be talking the talk, but not walking the walk.